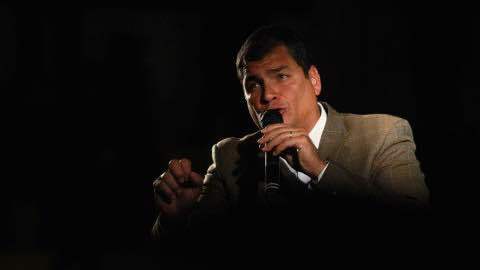 Few Americans could likely find Ecuador on a map or pick its president, Rafael Correa, out of a lineup. However, Correa recently announced an economic plan that should make us pay closer attention to this small South American nation. Citing the corrosive impact of excess inherited wealth on democracy, Correa proposed a steeply progressive tax on large inheritances. It’s like an estate tax, but with a twist: Revenue from the plan would be issued as dividends directly to workers, rather than going to the government. The number of families paying the tax would be quite low, since just 3 in every 100,000 Ecuadorians receive an inheritance worth more than $50,000. On that $50,000 they'd pay just $350 in taxes, or 0.7 percent. The beneficiaries, on the other hand, include the entire population. The plan speaks to a central problem of modern economies. As Thomas Piketty illustrated in his blockbuster Capital in the Twenty-First Century, wealth concentrates at the top when left to its own devices. When that happens, the only effective counterweight is a tax. Sounds like an un-American idea, right? Wrong. The American people are deeply concerned about rising wealth inequality, a sentiment that crosses partisan lines as well as age, race, and class. A recent poll by The New York Times and CBS shows that two-thirds of Americans see the gap between the rich and poor getting larger and think wealth should be more evenly distributed. A majority -- 57 percent -- also believe the government should be doing more to address inequality. Nearly 70 percent think taxes should be raised on millionaires. These sentiments are not unfounded. The richest one tenth of 1 percent of Americans -- that’s about 160,000 families, each with assets over $20 million -- now owns about as much wealth as the bottom 90 percent, about 110 million families, combined. That top tenth of a percent has seen its wealth grow 5 percent per year since 1986. In the same time frame, the bottom 90 percent has seen its wealth rise precisely 0 percent. Since 1916, in an effort to put a check on inherited economic power, the United States has imposed an estate tax on the transfer of immense fortunes. Affecting just the top two tenths of 1 percent of households, only 5,000 households annually, the tax doesn’t impact middle and working class families. With inequality on the rise and such overwhelming support for government intervention, one might think Congress would follow Correa's example of increasing taxes on the wealthy. Unfortunately, our lawmakers are taking the opposite course. The 2001 Bush tax cuts drastically reduced the impact of the estate tax, slashing the rate and increasing exemptions. Republicans in the House of Representatives recently doubled down on this effort by voting to fully repeal the tax altogether in April. If the Senate follows suit, that would give a massive tax cut exclusively to the ultra wealthy, leading to a spike in federal deficits, the slashing of vital public programs, or both. That speaks volumes about whom supporters of repeal are really working for. Congress should take a cue from Ecuador, and from the American people, and work to reduce inequality. Expanding, not repealing, the estate tax is a good step in this direction. "Ecuador Puts Piketty Into Practice"